The wide range of A.V.R Wall Mounted Stabilizer we offer to customers can be fitted on wall and thus covers less space. These inverters are made of high grade plastic that provides them strength and durability. We also check the quality of the product on various criteria before sending it to the customer. 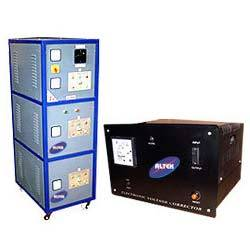 The range of inverter is offered at the most reasonable prices to client. Input range 90–270, 140-280 & 160–260 Output 220v ± 9%. Load capacities range from 4KVA/5KVA. Completely Copper bound Buck/boost transformer. Special Grade Silicon Steel Lamination for transformer. Electromagnetic relays for reliable performances. Wall Mounting Model also available for Air conditioning. Micro Controlled kit for controlling the Voltage..